Daryl Powell: "We got pulled apart way too easily at the weekend." 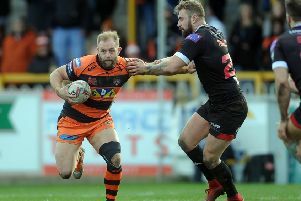 Castleford coach Daryl Powell is looking for a much-improved defensive display and far fewer errors in Sunday’s Super League clash at high-flying Widnes Vikings. Powell was relieved to collect two points from last Sunday’s high-scoring home game against Huddersfield but he knows his side will have to play much better if they are to end a run of three successive away defeats. The Tigers boss expects a stern test against third-placed Widnes who have an excellent home record on the artificial surface at the Select Security Stadium. “Our error count has been too high. We’ve been talking about that for a number of weeks so that’s one area we need to fix up and we certainly need to tighten up defensively,” Powell told the Express. “We need to be a little bit better in contact and hold our line more solidly. We got pulled apart way too easily at the weekend. “Those two components would help massively moving into this game because we are going to get challenged at Widnes. They are a really good attacking team. “They have started the season really well and they are playing some pretty smart stuff. I think Denis Betts has done a really good job. “They are solidly defensively and they challenge you with the ball. They are pretty fluent with the way that they play so it will certainly be a real challenge for us. “They like their home surface. Obviously, it’s an artificial surface and they play on it more than anyone else and they train on it consistently so they are used to the nuances of the surface. It is different - there’s no question - so we’ll have to get used to it pretty quickly. Powell, who was without 10 first-teamers for the 38-34 win against Huddersfield, expects to have several players back this weekend. Grant Millington is rated a “serious doubt” for Sunday after he sustained a quad injury against Huddersfield and Benny Roberts is still struggling to shake off a foot injury. “Benny failed a fitness test on Saturday. He had pain-killing injections and it didn’t work as well as we wanted it to so he’s still trying to get himself back,” added Powell.